Known most widely for their art prints, Belle & Boo combine vintage charm with a modern aesthetic. 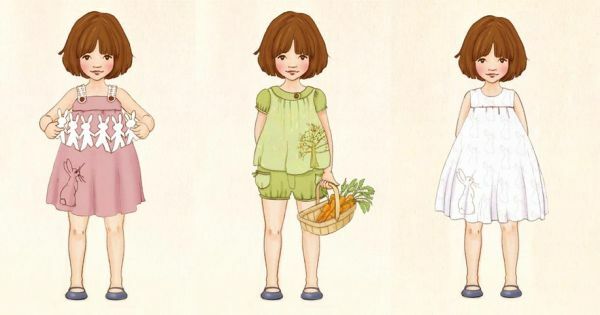 Their style is instantly recognisable – elfin children playing in the forest, Belle cuddling her bunny Boo, little boys and paper planes and beautiful drawings depicting the seasons. As well as prints, the designs appear on badges, cards and homewares and the newly launched clothing range. The Belle & Boo clothing collection is small but exquisite. A dusty pink pinafore dress featuring Boo the rabbit embroidered in chocolate brown; a sublime green cotton sateen blouse and shorts set featuring a hand-embroidered tree and adorable signature Boo print lining; and a superb white cotton organdie dress with Boo lining that shows faintly through the fabric. The designs are playful and sweet. Pieces are priced from $79 – $89 and are available in sizes six months to four years. For a huge selection in the Belle & Boo range, as well as the dresses which have just arrived in Australia, go to the Lark website.